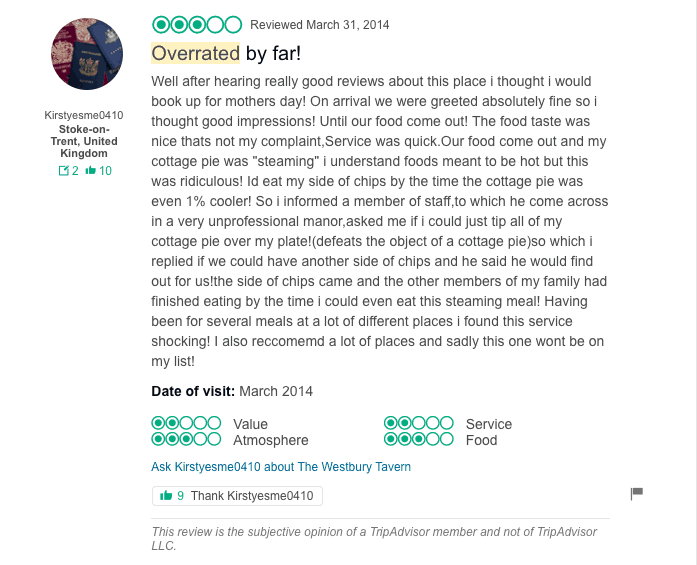 TripAdvisor: Why Respond to Reviews? If you’re not responding to online reviews (negative and positive) through your TripAdvisor for Business account, you may be missing out on the opportunity to drive new business. 83 percent say TripAdvisor reviews make them feel more confident in their travel decisions, and 96 percent of hotels and hospitality brands worldwide say reviews are influential in generating bookings. Hotels and accommodation properties that respond to TripAdvisor reviews enjoy 17 percent higher levels of engagement and are 21 percent more likely to receive a booking inquiry than those who don’t respond to reviews. Businesses that respond to more than half of their reviews are 24 percent more likely to receive a booking inquiry via TripAdvisor. Hotels and B&Bs that respond to 65 percent of their reviews receive an average review rating of 4.15, compared to only 3.81 for those who have not taken the time to answer any of their customers’ reviews. These numbers suggest that the more engaged the business owner — particularly when it comes to responding to TripAdvisor reviews — the more interested the consumer. Taking part in the conversation and demonstrating that the owner cares about feedback can definitely help a traveler convert from a casual browser into a potential guest. In order to reply to a review, you need to be registered with TripAdvisor’s Management Center. (Read our guide for claiming your TripAdvisor profile). Choose the TripAdvisor review you would like to respond to by clicking on the review in the left-hand sidebar. Reviews can be filtered by date, title, rating, language and response status. Enter your review response into the box provided. There is no character limit but remember: nobody wants to read an essay. Before drafting your TripAdvisor review response, be sure to read the site’s Management Response guidelines. Your response will need to meet these guidelines in order for it to be published. On TripAdvisor, you can sign up to receive email notifications every time a new review is published. This will help you decide which reviews to respond to. Under the “Emails for Owners” tab, next to “Reviews Questions” make sure the “Subscribed” bubble is selected. You can also use review management software like ReviewTrackers to monitor and track reviews on TripAdvisor (along with reviews on 100+ other review sites). The software automates your review collection and delivers notifications when your customers provide feedback and leave reviews. 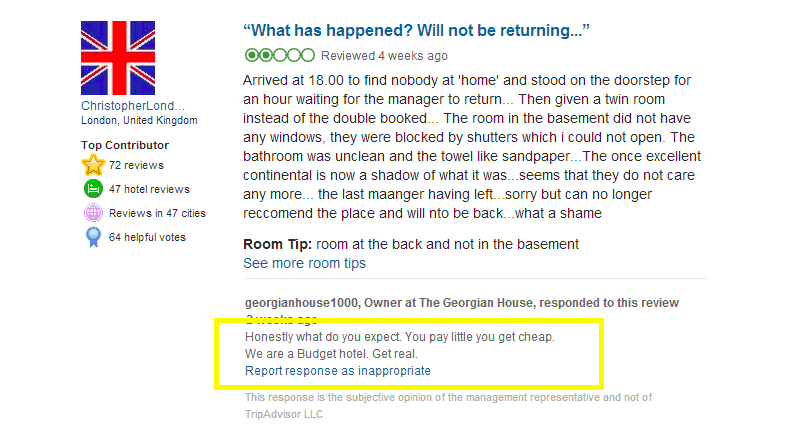 Currently it is not possible to edit your response to a TripAdvisor review. If you want to change something, the best thing to do is to delete your original response and resubmit the edited version. Do it ASAP. By quickly responding to a TripAdvisor review, you can show prospective guests that you take customer service seriously. It also allows them to hear your side of the story as soon as possible. Say thank you. These two words go a long way in showing travelers that your business values customer feedback. Resolve issues. Avoid cookie-cutter responses that do not resolve or address any specific issues raised in the review. Sometimes even positive comments and five-star ratings may include points of concern that the customer wants to discuss with you. Don’t lose your cool. Bad reviews hurt. But you can protect your brand reputation by responding politely and professionally to TripAdvisor users and by solving their customer experience issues. Highlight the positives. Highlight any positive feedback or comments the TripAdvisor reviewer has made. You can even take the opportunity to mention related services or planned upgrades that you would like to share with potential visitors. Invest in tools that drive efficiency. Replying to TripAdvisor reviews can be a lot of work, especially for global hotel chains and multiple-property brands. To ensure efficiency, consider investing in review management software that centralizes your reviews and helps your organization stay on top of what customers are saying. You definitely don’t want to be logging in and out of every TripAdvisor listing manually. Let’s look at some examples of how businesses are replying to reviews (both good and bad) on TripAdvisor. When a loyal customer expressed her disappointment with her anniversary stay at the Stamford Plaza in Brisbane, executive assistant manager Dale John wrote a pitch-perfect response. 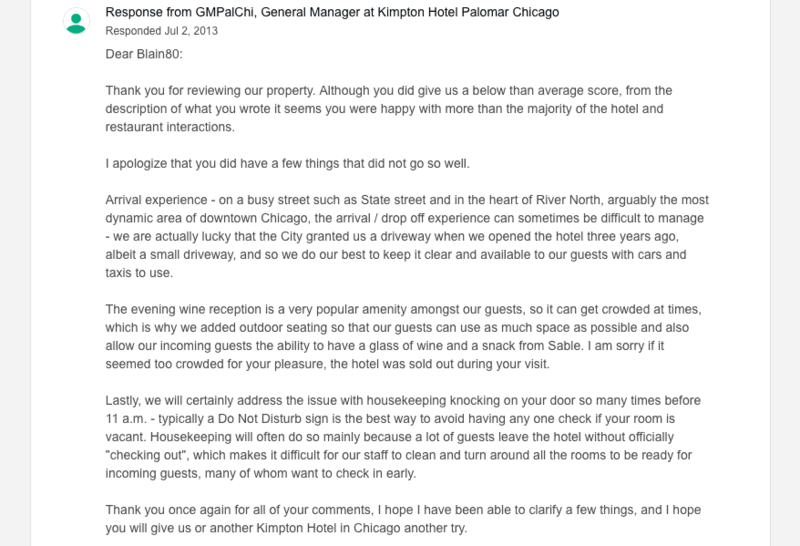 The response addressed the reviewer and started with a “thank you.” It was also very specific about the customer’s experience, and it provided information on how the hotel planned to resolve certain issues and maintain its usual standards. 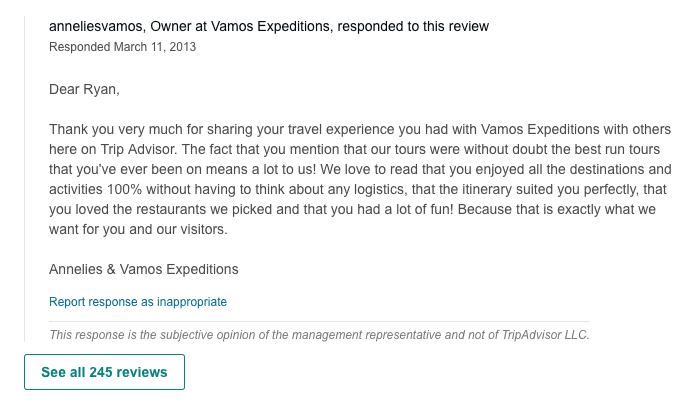 Another review response example worth following is that of Annelies Hamerlinck, owner and manager of Vamos Expeditions in Lima, Peru, for her response to a five-star review. It’s a personal, friendly, positive and concise response to the TripAdvisor reviewer and shows clearly that management took the time to carefully read and understand what this reviewer was saying. It’s clear this is not a ‘pre-made’ response. The review response also cleverly repeats positive phrases of the reviewers in exactly the same words as they used them in the review. 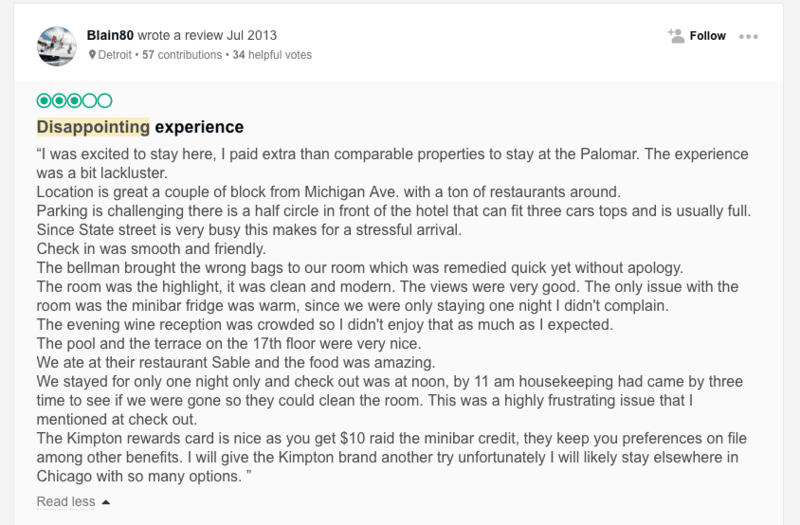 The Kimpton Hotel Palomar in Chicago is one of the top hotels in the city on TripAdvisor. Even if the hotel misses instead of hits, the general manager is quick to respond (professionally and politely) to the reviewer, demonstrating that management truly cares about guest feedback. 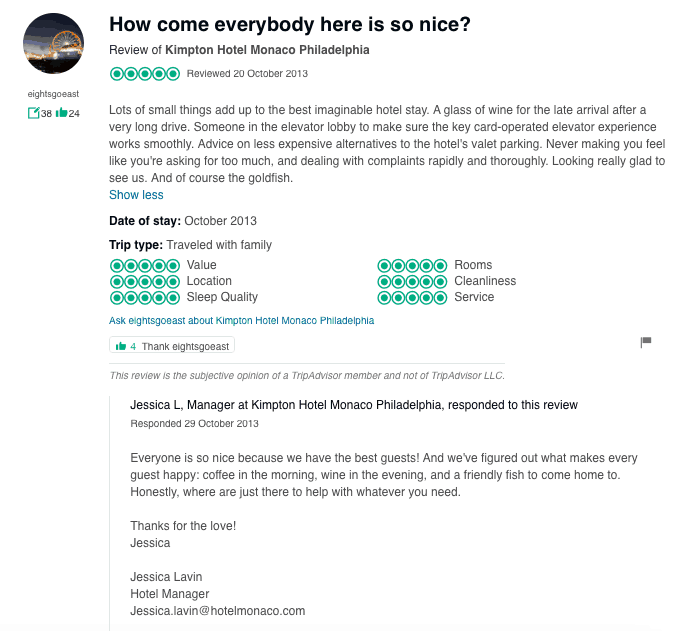 Jessica Lavin of Hotel Monaco in Philadelphia saw a positive review as an opportunity to savvily pay the hotel guest a compliment. There are hundreds of ways you can say thank you, and this review response takes advantage of that. It’s simple, well-written, and personalized, and it shows genuine appreciation for the words the customer wrote. It highlights the sense of community that the hotel has. It’s not uncommon for some positive reviews to contain a bit of constructive criticism. 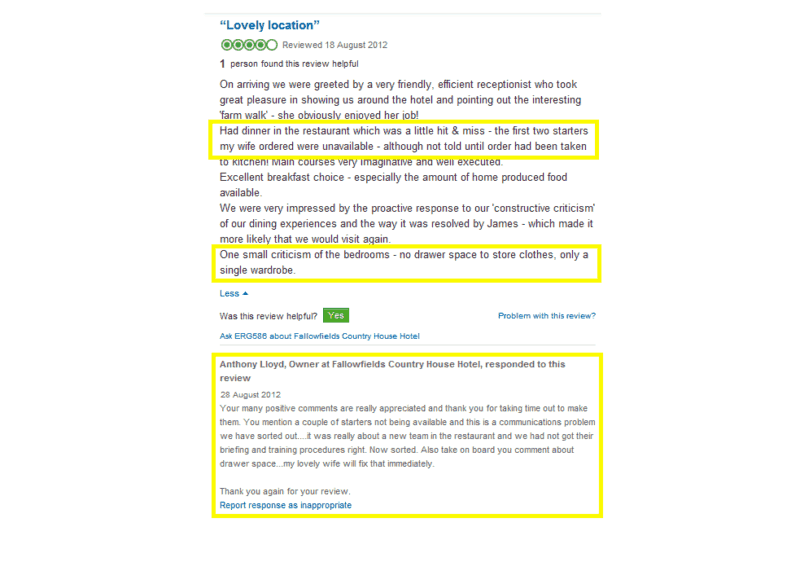 Here’s a classic example, from a TripAdvisor review of Fallowfields Country House Hotel. The TripAdvisor review response begins and ends with an expression of gratitude. 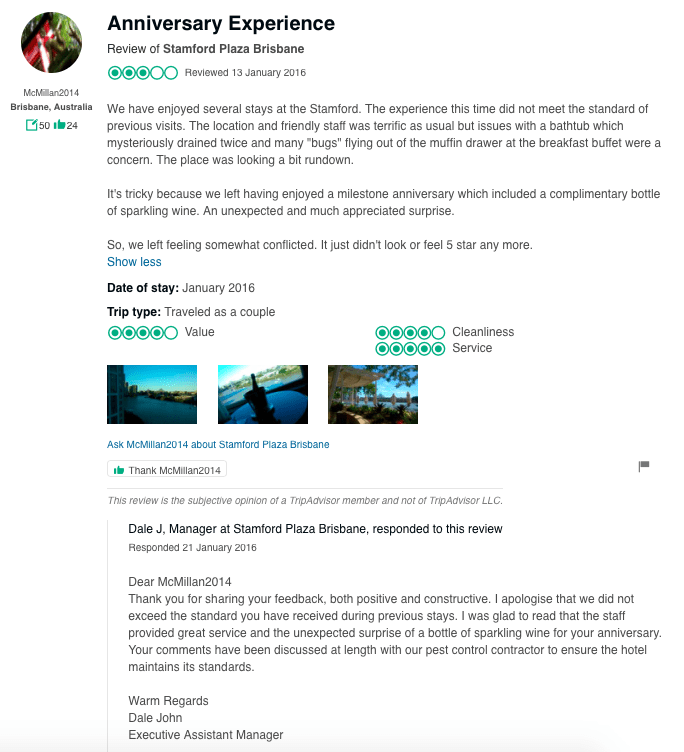 Anthony Lloyd, the owner of the hotel, also responded to the TripAdvisor review in a way that takes the constructive feedback on board, while also reassuring the reviewer (and other potential customers) that the issues are already being sorted out. 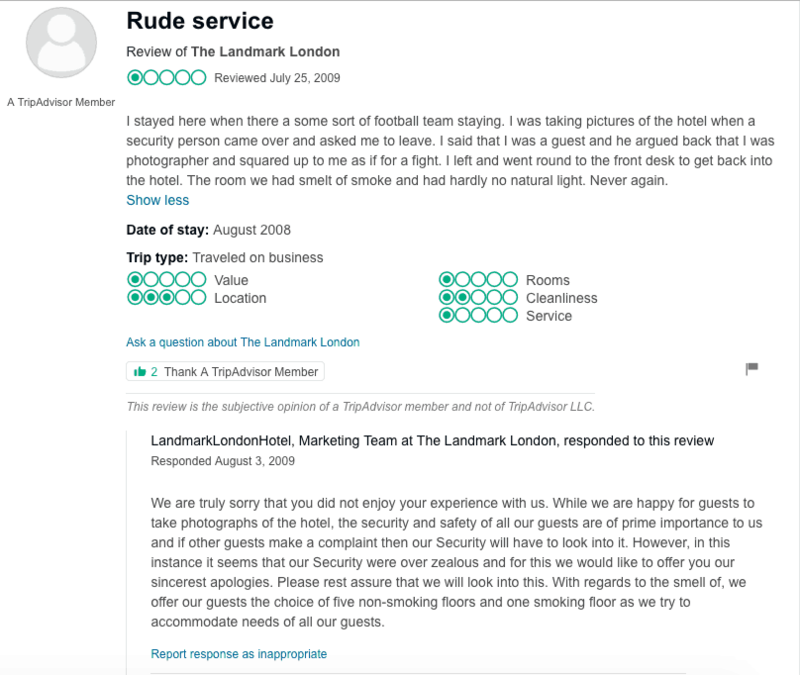 The Landmark London consistently generates glowing TripAdvisor reviews from hotel guests, but if the occasional negative review comes in, the hotel is quick to track and respond. The London Landmark is not a cheap hotel. (Prices range from $500 to $4,150 a night.) Naturally, guests will have extremely high expectations of everything that the hotel claims to offer. In cases wherein these expectations are disappointed, and a guest subsequently posts a bad review, the London Landmark is quick to respond, and in a way that minimizes the impact of negative feedback while being demonstrative of how much the business cares about the guest experience. Here’s some background story on this example: customer Kirsty visited Julie Despot’s Westbury Tavern Restaurant in Clayton, Newcastle-under-Lyme in the UK on Mother’s Day. She ordered cottage pie but found that it was too hot, so she had to wait to eat it until after the rest of her family had finished their dinner. Kirsty made a point of saying this in her three-star review of Westbury Tavern on TripAdvisor. It reportedly took a couple of attempts to get the review through TripAdvisor’s filter. When it finally appeared online, Kirsty’s sentiments were made clear. “Overrated by far!” she exclaimed. That’s when Julie decided to write her response. As you’ll see in Julie’s response above, Kirsty was being made fun of for her bad spelling and grammar. Note to business owners: we recommend that you never do this. Treat your customers like royalty. Even after being interviewed by news site the Sentinel, Julie said she did not regret the way she responded to her unhappy customer. In fact, she thought Kirsty was simply pulling an April Fool’s Day joke. 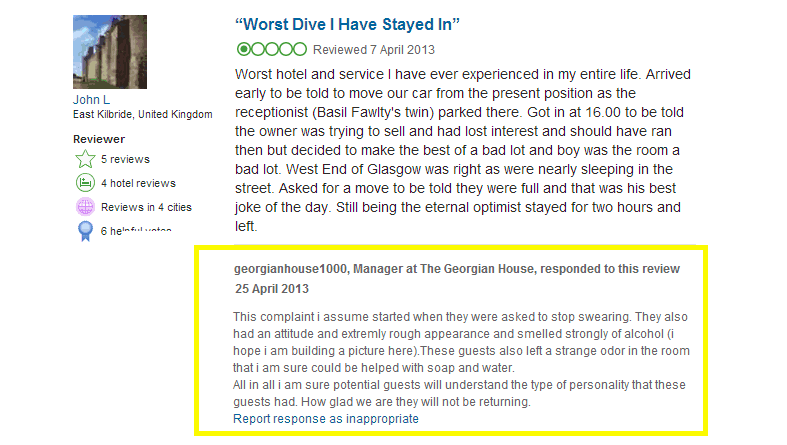 According to reports, the manager of the Georgian House Hotel in Glasgow has been fired (and rightly so, we think) after reacting sharply to negative reviews of the property on TripAdvisor. The unnamed ex-manager has repeatedly slammed guests when responding to criticisms they had posted on the popular review site. Other guests who did not particularly enjoy their stay at the Georgian House Hotel also received similarly vicious management responses. A lesson in diplomacy and humility! Diplomacy helps in all ways to churn the needed viewership and exhilarate the business. Maintaining a customer relation is a toughest of the jobs. Trip Advisor does it right, other can have a piece of it too. I am not convinced the management reviews for positive reviews make a difference. The source stated in this article is from Trip Advisor, they can not be objective here. The more engagement from anyone, the more they can charge operators, restaurants and mine their enormous data base. I do read the management response to negative reviews (and i also write them for my company). My biggest issue is how cookie-cutter the management responses are. And what evidence that once the reviewer submits they even see the management response? Clearly I have issues with Trip Advisor and how they now conduct their business. The truth is, this is NO longer a respected review site. EVERYTHING Trip Advisor does is to increase sales through their site. They take a 25% commission on tours, excursions. They are not what they were.